The wait is almost over! Mad Men will be returning to AMC this Sunday, Aug. 16, at 10 p.m. ET/9 p.m. CT. 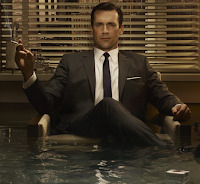 The third season of the critically acclaimed series set in the Sterling Cooper advertising agency is sure to create more questions than it answers for the series' characters, especially one philandering Don Draper (pictured, Jon Hamm, courtesy AMC).